20 ct. Courtesy of Ronald Ringsrud and Ronald Leon; photo © Harold & Erica Van Pelt. One of the greatest concerns with emerald filling is the degree of clarity enhancement such treatment represents. Stones that appear to have excellent clarity with the unaided eye are often revealed to have an extensive network of filled fissures, or some in areas that could be easily damaged. Using the GIA diamond clarity grading system as a framework, the GIA Gem Trade Laboratory has devised a methodology to establish the size, number, and position of filled fissures in an emerald and on this basis to classify the apparent degree of clarity enhancement achieved. Each of more than 500 filled emeralds was classified by experienced gemologists to determine the usefulness and reproducibility of the methodology. Backed by this research, GIA will be offering a new emerald report on which the degree of clarity enhancement detected will be indicated as “minor,” “moderate,” or “significant. In response to concerns expressed by members of the gem and jewelry industry regarding the use of organic fillers to enhance emeralds, GIA and the GIA Gem Trade Laboratory have been conducting an extensive study of fillers in emeralds. This research focuses on three major areas: (1) identification of the specific filler used in an emerald; (2) determination of the extent to which an emerald has been filled; and (3) examination of the response of different fillers over time and to normal conditions of wear, care, and manufacturing. The first area was addressed in the Summer issue of Gems & Gemology by Johnson et al. (1999); they concluded that distinctions can be made in some cases for “pure” fillers, but that the detection of one substance in a fissure does not prove that all others are absent. While research on the third item is still in progress, the present article reports the development of a method to determine the extent to which a particular emerald has been filled as an indication of the degree of clarity enhancement. Based on the results of this research, in early 2000 the GIA Gem Trade Laboratory will be offering a new emerald report that will describe the level of clarity enhancement in natural emeralds. We hope that this type of report will help dealer and retailer alike reestablish consumer confidence in emeralds (figure 1) by providing information needed to make an educated purchase decision. 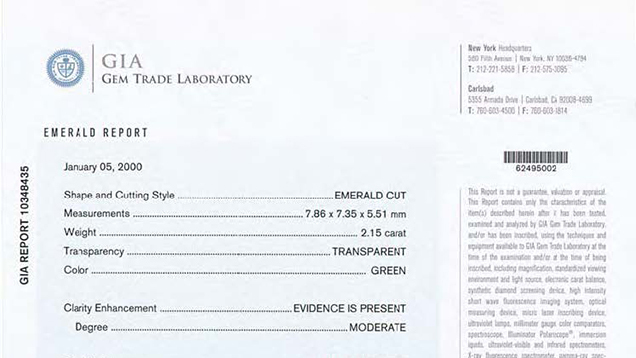 Although the GIA Gem Trade Laboratory is not the first gemological lab to offer such a report, we believe that this is the first article to reveal the materials, methodology, and results of the study on which a system for classifying the degree of enhancement in an emerald is based, as well as the general criteria used. The vast majority of natural emeralds, regardless of their locality of origin, contain fissures that may affect the appearance of the cut stone. Over the last few years, clarity enhancement in emerald (to reduce the visibility of these fissures) has caused a great deal of consternation in the jewelry industry. This was the primary focus of the International Emerald Forum (November 1996) and the First World Emerald Congress (February 1998), both held in Bogotá, Colombia. Much has been written about enhancement substances and the methods used to identify the filling materials (e.g., Hänni et al., 1996; Johnson et al., 1999; Kiefert et al., 1999). However, many emerald dealers and laboratories have also focused their attention on the amount of filler in a given emerald (i.e., whether the stone is lightly or heavily treated), as an important indication of quality (SSEF Swiss Gemmological Institute, 1998). In fact, at the First World Emerald Congress, which two of the authors (SFM and TMM) attended, the consensus among dealers and producers from around the world was that determining the relative amount of filler in an enhanced emerald was a more important issue than identifying the filler itself (Johnson and Koivula, 1998). A few laboratories already offer such a service (see, e.g., SSEF Swiss Gemmological Institute, 1998, pp. 74–86; and reports by the AGTA Gemological Testing Center and Gübelin Gem Lab). To our knowledge, though, the criteria used for the different categories have not been published, although we have been told that AGTA uses a weighted numerical system to arrive at their clarity-enhancement categories (K. Scarratt, pers. comm., 1999). We began to investigate how we might define these criteria in a repeatable and teachable way shortly after the February 1998 Congress. The following study was conducted to establish a systematic method of measuring the amount of filler in surface-reaching fractures in emeralds, with the goal of providing a consistent approach to determining the extent of clarity enhancement, with reproducible results. Study Samples. To address the issue thoroughly, we included in our research project all qualities of emeralds (from heavily included, inexpensive goods to relatively clean, high-quality material) from a variety of geographic sources. We borrowed approximately 150 filled emeralds from several dealers, and combined these with about 100 emeralds submitted to the Gem Trade Laboratory for reports and about 250 emeralds acquired for the emerald study. We believe that the approximately 500 fashioned samples studied are representative of the full range of emerald qualities offered in the gem and jewelry market. These samples weighed from less than one carat to over 20 ct. They were examined over the period March 1998 through October 1999. The approximately 250 emerald-study samples were incorporated into the formal testing program only in their filled state. However, the authors examined them both before and after filling with various substances, to gain a better understanding of just how much the treatment was affecting the appearance of these stones. Throughout the study, we also used photographs of the stones in their unfilled state as a reference to see how much the appearance was enhanced in a particular emerald and confirm that the clarity classification it was given accurately reflected the relative degree of enhancement. From our examination of this large group of filled emeralds, we recognized that in some cases the filler provided little if any improvement in apparent clarity—usually because of an inferior cleaning and filling process, or deterioration over time. These stones, however, were a small minority of the samples examined. In general, our observations of the emeralds that we examined both before and after the filling process confirmed that the position and size of filled fractures present in a stone correlated well with the degree of enhancement in apparent clarity. Methodology. Test Participants. For this study, we used the most experienced gemologists from our laboratories in New York and Carlsbad. Each of the approximately 150 borrowed emeralds and most of the 250 study stones were examined by a minimum of five people. Because client stones are in the laboratory for such a short time, in some cases only two gemologists looked at each emerald (although three were used if there was a discrepancy in the classification given). enhancement. Photomicrograph by John I. Koivula; magnified 20x. Once the gemologists located the surface-reaching fissures and determined that they had been filled or partially filled, they were asked to classify the degree of apparent enhancement according to a combination of the size (length), extent (depth), number, and location of fissures, and the amount of filler present in them. The amount of filler present in the fissures was established microscopically with supplemental fiber-optic illumination (see, e.g., Koivula, 1982). For some emeralds, a distinctive ultraviolet fluorescence (which is a standard test in emerald identification) may also reveal the location, size, and extent of filled fractures (see, e.g., Johnson et al., 1999; Kiefert et al., 1999). Establishment of Clarity-Enhancement Criteria. To establish the general criteria for the emerald clarityenhancement classification system, we turned to the well-respected GIA system for clarity grading diamonds (for a description of this system, please see the GIA Jeweler’s Manual, 1989). Although we knew from our experience with emeralds that the specific criteria would have to be very different, this system provided a good starting point for establishing general parameters. As an added benefit, we found that using the diamond grading system as a frame of reference made it easier to train our gemologists and communicate some of the key concepts. For example, we determined that the classification criteria of size, nature, and position of the filled fractures could be used in the assessment of emerald clarity enhancement in the same way that the size, nature, and position of inclusions are used in diamond clarity grading. In addition, we established the classification categories for emeralds so that they followed a flow similar to that of the graduated clarity grade ranges of diamonds. From the beginning, however, it was made clear that the emerald clarity-enhancement classification system is distinctive. Specifically, whereas diamond clarity grading incorporates all inclusions, the emerald system is concerned only with filled surfacereaching features. That is, the categories in the emerald system represent a visual assessment of the size, extent, number, and location of surface-reaching features (and the amount of filling they contain) relative to: (1) the size of the emerald, and (2) the approximate appearance of the emerald in the face-up position if it were in an unfilled condition. Although number is relevant in evaluating the degree of emerald enhancement, number and color do not play the same role as they do in diamond clarity grading. Also, we could not use apparent visibility as a criterion for evaluating emerald clarity enhancement, since the goal of this treatment is to make the fissures less visible. Indeed, some fillers are so successful that the fissures can be very difficult to locate (again, see figure 2). For this reason, the gemologist needs to use a range of magnifications to determine the emerald clarity-enhancement classification, not strictly 10∞ as is the standard with diamond clarity grading. In some stones, too, visibility varies from fracture to fracture, and some fillers change their appearance over time. We started with general guidelines and then had (in most cases) five or more of the most experienced gemologists from our New York and Carlsbad laboratories make independent observations. As the study progressed, we expanded the group of gemologists involved. We asked the participants to place each clarity-enhanced emerald into one of three categories. When studying our samples, we found that distinguishing among more than three categories for degree of enhancement was impractical because one could not consistently assess the effect that fine differences in amount of filler had on the visual appearance of the emerald. In addition, throughout the emerald trade, three to four categories have been suggested and applied by other organizations (see, e.g., reports issued by the SSEF Swiss Gemmological Institute, the AGTA Gemological Testing Center, and the Gübelin Gem Lab). Figure 3. 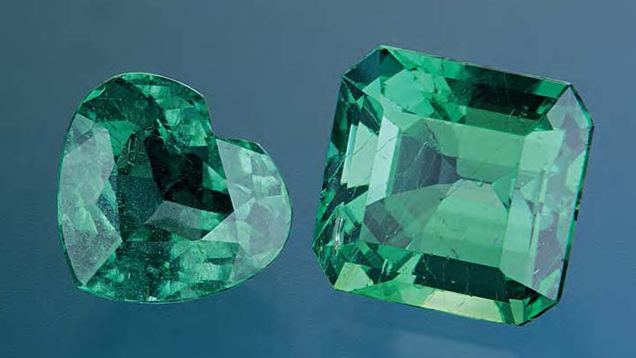 These images represent two examples of emeralds that would be placed in the “minor” category of the clarity-enhancement classification system. The “minor” category reflects the fact that the clarity enhancement has had only a slight effect on their face-up appearance. The images on the left show the emeralds before they were filled, and the images in the center show them after filling. The diagrams on the far right are plots of the fissures in these two emeralds as they reach the crown and pavilion surfaces. Note, however, that the depth of a fissure is not indicated on any of the plots shown in this article (which are for information purposes only here, and will not be included in the redesigned emerald report). Photos by Maha Tannous. In general, for the purposes of this study, the presence of filled fissures that would fit into the VVS2 through VS2 range in the diamond clarity grading system (i.e., with regard to the size and extent of the filled fissures relative to the size of the stone and their position in it) was considered minor enhancement (figure 3); emeralds with filled fissures corresponding to the SI1–SI2 range were moderately enhanced (figure 4); and those that would fall in I1 and below were significantly enhanced (figure 5). Figure 4. These two emeralds would be classified as “moderate” in the clarity-enhancement classification system. This category indicates that the fissures present have a noticeable, but not extreme, effect on the face-up appearance of the emeralds. The images on the left show the stones before they were filled, and the images in the center show them after filling. The diagrams on the far right are plots of the fissures in these two emeralds as they reach the crown and pavilion surfaces. Photos by Maha Tannous. Figure 5. A clarity-enhancement classification of “significant” would be given to each of these two emeralds. This category indicates that the clarity enhancement has had an obvious effect on the face-up appearance of the emeralds. The images on the left show the stones before they were filled, and the images in the center show them after filling. The diagrams on the far right are plots of the fissures in these two emeralds as they reach the crown and pavilion surfaces. Photos by Maha Tannous. We reviewed the results for the different gemologists on each stone to (1) determine the degree of consistency in the individual classifications, and (2) ensure that the “boundaries” that marked a move from one category to the next were adequately defined. Minor adjustments were made in the course of the study to resolve boundary discrepancies. Given our gemologists’ knowledge of the clarity grading system for diamonds, and their experience with emeralds, we found this system to be easily teachable to them. Although, as noted above, some fine tuning of the three categories was done throughout the study to make sure the boundaries were adequately demarcated, for the most part the original categories established worked well: From the beginning of the research project, for the vast majority of stones, most of the gemologists were consistent in their clarity-enhancement classification calls on the same stones. It cannot be stressed enough, however, that whereas diamond clarity grading incorporates all internal features, the categories in the emerald clarity- enhancement classification system address only the filled fissures and other surface-reaching features in a stone—their number, size, and extent relative to the size of the stone, and where they are located. Consequently, this classification system is used solely to evaluate the degree of apparent enhancement that these filled features represent; the system does not constitute an overall “clarity grade” of the emerald. Nor does it take into account inherent inclusions, such as mineral crystals, or primary and secondary fluid inclusions. Likewise, inclusions that do not reach the surface of the emerald cannot be filled and therefore are not properly considered in a system that only evaluates the filled fissures in a stone. Since, in our view, the presence of filled fissures of VVS1 size (that is, extremely small relative to the size of the stone) would not noticeably affect the appearance of an emerald, we include such stones under the category of “No evidence of clarity enhancement was detected.” We based this on the premise that if the appearance of an emerald is not affected, then the presence of a minuscule amount of filler does not constitute an enhancement. It is important to remember that with this clarity- enhancement classification system, as with the system for clarity grading diamonds, all of the relevant factors must be taken into consideration to place the emerald in a specific category. For example, a small filled fissure directly beneath the table of an emerald would have a greater impact on the appearance of the stone than a larger filled fissure along the girdle, and thus the smaller fissure could result in the stone receiving a more severe enhancement classification. Also, a stone may have fewer filled fractures, but if they are in an area where risk of damage is high, the emerald will be placed in a lower clarity-enhancement category. The quality of the filler is not a primary consideration when classifying the degree of enhancement of emeralds. Typically, a whitish or deteriorated filler is not interpreted any differently from a uniformly transparent filler. The guiding premise in classifying the degree of clarity enhancement is the presumed appearance of the emerald before it was filled. It is also important to point out that the emerald clarity-enhancement classification system, just as with the diamond grading system, is subjective by nature and can only be learned with practice and experience. One cannot expect to be proficient at such a system by simply reading about it or taking a class. From our experience with the laboratory gemologists who participated in this study, however, we believe that the tens of thousands of graduates trained in the GIA diamond grading system will readily understand the basic criteria used. On the basis of these results, in early 2000 GIA will be offering a new emerald clarity-enhancement classification service that will coincide with a complete redesign of the GIA Gem Trade Laboratory identification report. The report information for single unmounted stones will now be presented in a tabular format on a document that incorporates many document security features and a detachable reference tab small enough to fit inside a parcel paper. 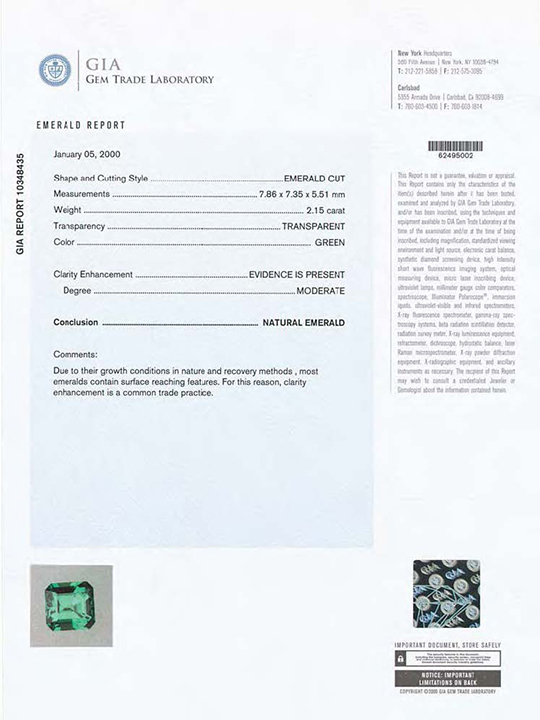 The Emerald Report (figure 6) will also include a digitally generated color image, to illustrate the appearance of the stone at the time it was examined in the laboratory. We believe that this will help protect the user of the report in those situations where the emerald is enhanced or the filler deteriorates after the report has been issued. We chose the terms minor, moderate, and significant to describe the level of clarity enhancement because they are already in use by several other laboratories and, as was discussed at an international meeting of laboratories held in Bern, Switzerland, on May 7, 1999, the harmonization of word terms between laboratories should help alleviate confusion both in the trade and with consumers (Wade, 1999). Again, this classification system is used solely to evaluate the level of enhancement that filled surface-reaching features represent in an emerald, and not to offer an overall “clarity grade” for the emerald. Emerald clarity-enhancement classification reports will be issued for loose natural emeralds only. Therefore, it will be necessary to identify the gemstone before providing a report. This identification will be included as part of the new report. If a stone turns out to be anything other than a natural emerald, if an emerald is mounted, and for clients who want an identification only, a standard gemological identification report will be provided along with a statement as to whether any enhancement was present. If filled fissures are observed, the identification report will include the statement that “Evidence of clarity enhancement was detected,” but no quantification will be given. 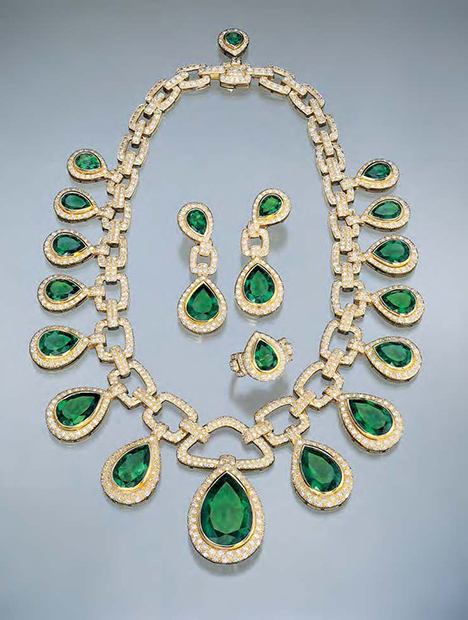 Although it is tempting to correlate the degree to which an emerald has been clarity enhanced to the value of that stone, the extent of filler present is only one part of the value equation, which also includes color and weight (Drucker, 1999). “Significant enhancement” does not necessarily mean low value, just as “minor enhancement” or “no evidence of enhancement” does not necessarily mean high value (figure 7). Figure 7. Degree of enhancement is only one factor that may affect a stone’s value. The emerald on the left has many inclusions that are highly visible, yet it merits only a “minor” enhancement call because it has relatively few filled surface-reaching fissures. The eye-clean stone on the right appears to be of very high quality. However, the clarity enhancement is masking several large fractures. The emerald would look much worse if it were not filled, so it deserves a “significant” classification. Photo by Maha Tannous. Clearly, the amount of internal non-surfacereaching inclusions present in a given emerald will have a major effect on the value of that stone. The value of a low-quality emerald that is heavily included will not be improved at all by a report that says it has only minor enhancement. Conversely, an “eye-clean” emerald that gets a report stating that it is significantly enhanced will probably see a negative impact on its value when compared to an eye-clean stone with less enhancement. Most consumers and dealers alike would probably agree that color is the single most important factor in determining the value of a colored stone. Clarity enhancement cannot change the inherent color of a stone. A poorly colored emerald will always be poorly colored unless artificial coloring agents such as dyes are added. However, clarity enhancement can change the appearance of a stone’s color. 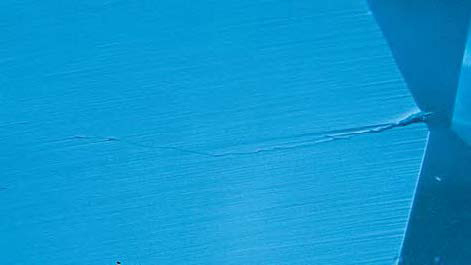 By changing the visibility of fissures in a stone, clarity enhancement reduces the amount of light scattered or reflected by those fissures, so the color of the stone may appear better than it was before. That is what gem treatment is all about: changing the appearance of a stone so it looks better than it did before it was treated. Consequently, if we have two emeralds where all other factors are equal (e.g., internal inclusions and color), the stone that shows only minor enhancement will be more desirable than the one that is significantly enhanced. This correlation between treatment and value is true for many types of stones and treatments. A good example would be the effect of heat treatment on corundum. A non-heat-treated sapphire will still not be valuable if, for instance, it is too pale or too dark. However, a heat-treated sapphire with good color and clarity will not have the same value as a similar-quality untreated sapphire. Of course, there are several critical differences between the treatments in emerald and sapphire. With heat treatment of sapphires, the stone itself is being changed and the change is permanent, whereas with the filling of emeralds it is only an apparent change and the change is not permanent. The clarity enhancement of emeralds also masks the presence of fissures that may affect the durability of the stone, particularly if the fractures are large and are located where risk of damage is high, such as in a corner of an emerald-cut stone. We have devised a system for classifying the degree of apparent clarity enhancement in a particular emerald as minor, moderate, and significant. The extent of enhancement is based primarily on a visual assessment of the total amount of filling in surfacereaching fractures as determined with microscopic examination. A combination of factors such as the size of the filled features, where they occur within the emerald, and their quantity relative to the size of the stone also affect the final classification. To confirm the consistency of this classification system and refine the boundaries between categories, we conducted a study whereby approximately 500 emeralds were examined (and placed in one of the three categories) by several experienced gemologists. This clarity-enhancement classification system is planned for introduction into the new GIA Gem Trade Laboratory Emerald Report in early 2000. If one were to take a heavily fractured emerald that has not been filled and obtain a report with the “no evidence” conclusion, and then subsequently treat the stone, the image on the report should show that the appearance of the stone has been altered. Note, however, that such changes may not be apparent for emeralds in which the enhancement is only visible with a microscope. We believe that additional information such as this, which will ultimately go to the final consumer, will help educate the buying public and make them feel more comfortable when purchasing emeralds and other colored stones, thus restoring the consumer confidence that has wavered over the last few years. Mr. McClure is manager of Identification Services, Ms. Tannous is senior staff gemologist, and Mr. Koivula is chief research gemologist, at the GIA Gem Trade Laboratory, Carlsbad, California. Mr. Moses is vice president of Research and Identification at the GIA Gem Trade Laboratory, New York. The authors thank the following individuals for providing emeralds of various qualities and degrees of enhancement that made it possible to create the foundation for this report: Ricardo Alvarez Pinzon, Luis Ernesto Vermudez, and others at Treatment World Emerald Gemológico Universal, Bogotá, Colombia; Dr. Rodrigo Giraldo, Centro Gemológico para la Investigación de la Esmeralda, Bogotá; Carlos Osorio, Mineralco, Bogotá; Jaime Rotlewicz, C. I. Gemtec, Bogotá; the staff of Alagecol (Asociación de Laboratorios Gemológicos), Bogotá; Ray Zajicek, Equatorian Imports, Dallas, Texas; Darrold Allen, Gemological Laboratory of Los Angeles, California; Kenneth Scarratt, AGTA Gemological Testing Center, New York City; Amnan Gad, Amgad Inc., New York City; Michael and Ari Gad, Gad International Ltd., New York City; Arthur Groom and associates, Arthur Groom–Gematrat, New York City; Morty Kostetsky, Arigad Gems, New York City; Dr. Kumar Shah, Real Gems Inc., New York City; I. Z. Eliezri, Colgem Ltd., Ramat Gan, Israel; Ronald Ringsrud, Constellation Colombian Emeralds, Saratoga, California. Many GIA colleagues provided support for this project, including: Dino DeGhionno, Karin Hurwit, Phil Owens, and Cheryl Wentzell of the GIA Gem Trade Laboratory (GTL), Carlsbad, and GIA Research colleagues Dr. Troy Blodgett, Dr. Mary Johnson, and Sam Muhlmeister. Drucker R. (1999) What you should know about enhancements and gem pricing. Jewelers’ Circular Keystone, Vol. 170, No. 1, pp. 124–127. GIA Jeweler’s Manual, 3rd ed. (1989) Gemological Institute of America, Santa Monica, CA. Hänni H.A., Keifert L., Chalain J.-P. (1996) How to identify fillings in emeralds using Raman spectroscopy. Jewellery News Asia, No. 145, pp. 154–156. Johnson M., McClure S., Koivula J., Moses T. (1998) How to detect clarity enhancement in emeralds. Modern Jeweler, Vol. 97, No. 1, pp. 58– 61. Johnson M.L., Koivula J.I., Eds. (1998) Gem news: A preliminary report from the First World Emerald Congress. Gems & Gemology, Vol. 34, No. 1, pp. 56–57. Johnson M.L., Elen S., Muhlmeister S. (1999) On the identification of various emerald filling substances. Gems & Gemology, Vol. 35, No. 2, pp. 82–107. Kammerling R.C., Koivula J.I., Kane R.E., Maddison P., Shigley J.E., Fritsch E. (1991) Fracture filling of emeralds: Opticon and traditional “oils.” Gems & Gemology, Vol. 27, No. 2, pp. 70–85. Kiefert L., Hänni H.A., Chalain J.-P., Weber W. (1999) Identification of filler substances in emeralds by infrared and Raman spectroscopy. Journal of Gemmology, Vol. 26, No. 8, pp. 501– 520. Koivula J.I. (1982) Pinpoint illumination: A controllable system of lighting for gem microscopy. Gems & Gemology, Vol. 18, No. 2, pp. 83–86. SSEF Swiss Gemmological Institute (1998) Standards and Applications for Diamond Report/Gemstone Report/Test Report. SSEF, Basel, Switzerland, 118 pp. Wade S. (1999) The power of words. Colored Stone, Vol. 12, No. 6, pp. 14–17.